If you have the budget and like it rough you should look into the Bajaboard G4 or G4X, a premium off-road electric board from Australia. 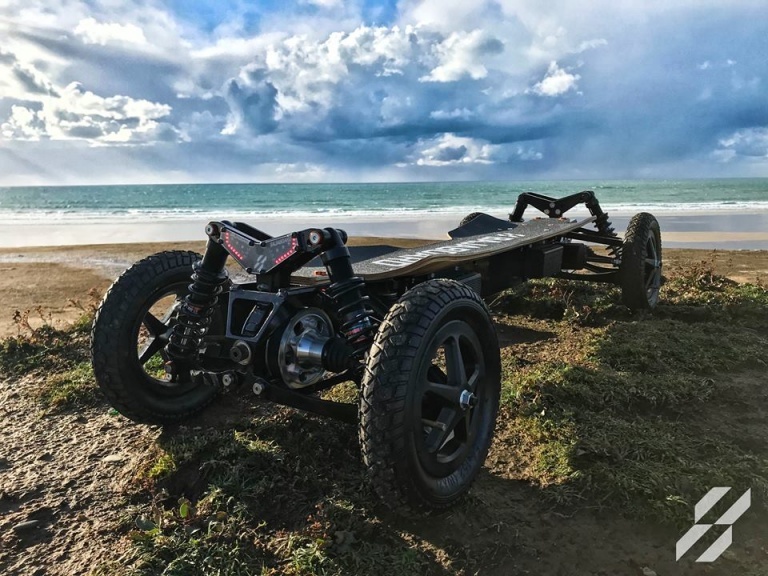 The extremely powerful electric skateboard does not only make up to 60 km/h or 37 mph, but also serves you on the beach and in the snow. 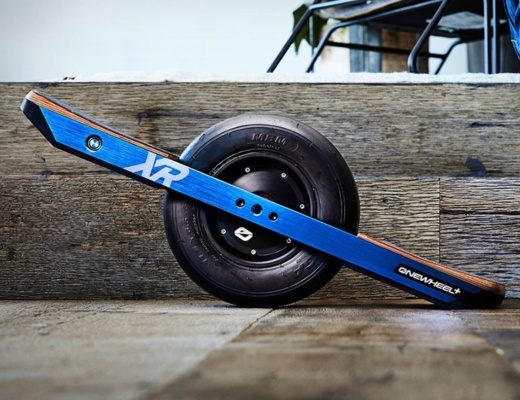 Yes, you read correctly – up to 60 km/h or 37 mph on the street and the same off-road electric board with super suspension is not afraid of any terrain. The GX 4 is powered by 4 brushless motors which accelerate the 10“ wheels even up hills of 45% grade. The smaller G4 with 2 motors is still good for 50 km/h or 31 mph and a 35% grade. The GX4 board offers traction control and electronic differential just as would expect it from your Jeep Wrangler. Both support regenerating braking which charges your board when you go downhill. 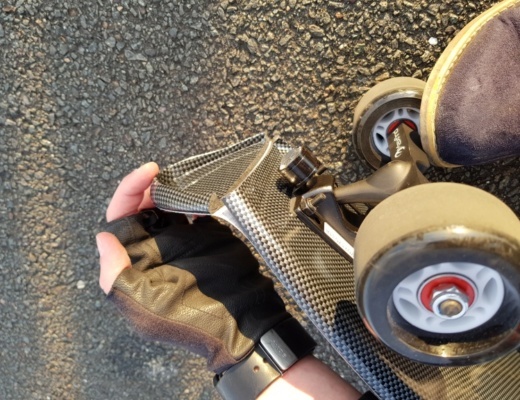 The GX4 Bajaboard offers a 900 Wh Lithion-Ion battery for a range of 30 km or 18.6 miles while the G4 has standard 600 Wh (22 km or 13.7 miles range) which can be upgraded to 900 mWh as well. The batteries are not swappable, but can be exchanged for maintenance or an upgrade as easy a car battery. It takes 2.5 to 3 hours to fully charge the batteries. 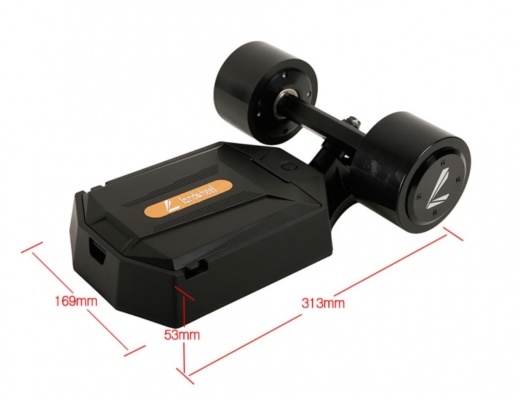 The boards weigh 22 kg or 48.5 lbs (G4) and 25 kg or 55 lbs (G4X) which is much less than other Off-road electric skateboards such like the Mo-Bo from Germany. 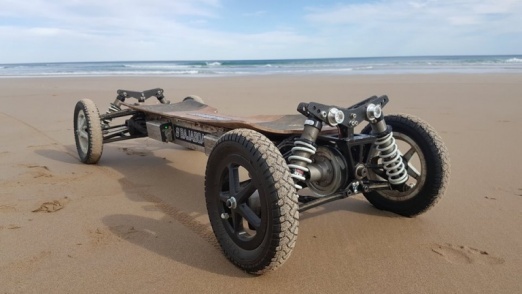 The Bajaboards are good for riders up to 110 kg or 242.5 lbs, but the specifications here are based on an 80 kg or 176 lbs rider. The suspension is adjustable for the riders weight and the terrain. 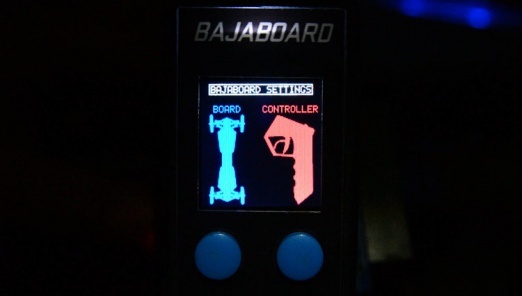 The Baja board remote control has a real-time display for your speed, battery status, throttle percentage, signal strength, distance and and is using vibrations to warn you about low battery or high speed. 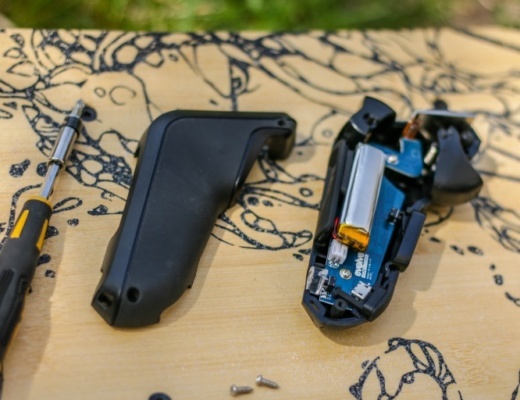 The remote control let’s you also customise your riding experience. You can limit the speed and acceleration, but also adjust the strength of the braking or brightness of your lights. And of course you can switch between the 3 riding modes called cruise, burnout and drift. The Bajaboard is water-resistant and good for wet surfaces but not water-proof. 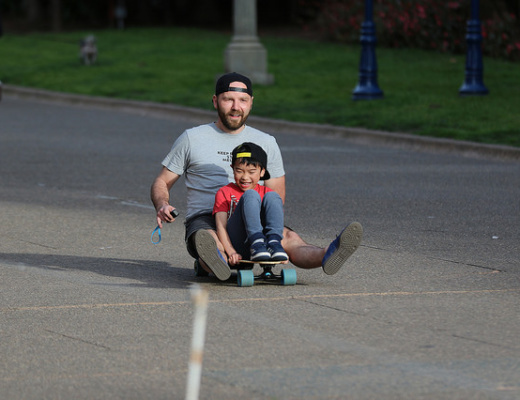 You can compare the Bajaboards with other e-boards in our electric skateboard comparison. Well, this power and advanced technologies comes with a price tag. The G4X is 4,500 EUR or 5,290 USD.